Going into The Host I didn’t know what to expect. The trailer looked promising and I had heard that Twilight author Stephenie Meyer’s adult book was better than her vampire romance novels. I cannot judge the book, having never read it, but The Host movie was unspectacular and downright weird. The plot goes like this: Aliens called “Souls” have invaded Earth and taken over nearly every human being (think Invasion of the Body Snatchers). Melanie Stryder (Saoirse Ronan) is captured and a Soul called Wanderer is implanted into her body. Instead of fading away, Melanie’s consciousness holds on and the two fight for control of Melanie’s body. Eventually Wanderer (now Wanda) helps get Melanie to her loved ones but things get (more) complicated when Wanda starts to have feelings for new guy Ian (Jake Abel) but Melanie is still in love with her boyfriend Jared (Max Irons). In the mean time, main antagonist, the Seeker (an awesomely stone faced/borderline psychotic Diane Kruger) is hunting for the last humans and using Melanie/Wanda to find them. With New Moon making over $230 million in the US and nearly $500 million worldwide, it was only a matter of time before the studio decided to try and milk the franchise for even more, and you really can’t blame them. There are two more books left in Stephenie Meyer’s series, Eclipse and Breaking Dawn. The film adaptation for Eclipse was shot alongside New Moon, Donner and Jackson style, and will hit theaters next year. Now it looks like Summit Entertainment will be splitting Breaking Dawn into two separate films. Some may or may not know what goes down in Meyer’s final book, but things get pretty intense. In nearly 800 pages, the entire story gets tossed on it’s head, with characters falling in love with offspring, and a few more characters dying off. It makes sense to split a book that large into two films, in order to stay true to the source. This strategy isn’t completely unheard of in Hollywood. The most recent example would be J.K. Rowling’s Harry Potter films. The final book was 759 pages long (4 more than Breaking Dawn) and will be split into two films, one to be released in November of 2010, and the second in July of 2011. Breaking Dawn won’t get a release until well into 2011, but before then Eclipse will be in theaters on June 30, 2010. Twilight author Stephenie Meyer’s movie machine keeps humming along as another of her novels has been grabbed by producers Nick Wechsler, Steve and Paula Mae Schwartz. 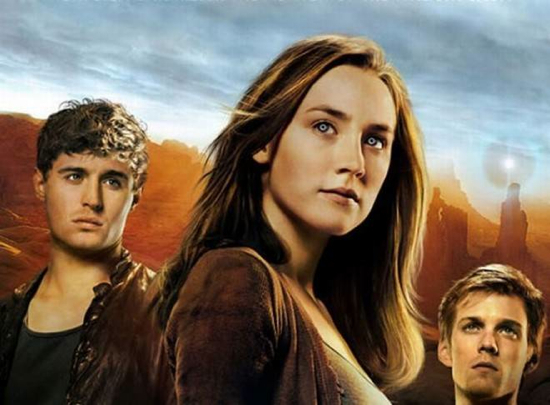 The trio, fresh from adapting Cormac McCarthy’s The Road to the big screen, reportedly used their own funds to acquire Meyer’s The Host, her first adult novel. In addition, the producers have tapped Andrew Niccol (Gattaca, The Truman Show) to pen the script and direct. In case you’re only familiar with Meyer’s Twilight novels, The Host follows a similar pattern and is a bittersweet love story set in a near future Earth which has been assimilated by an alien species of benevolent parasites. These creatures call themselves “Souls.” One such soul, the Wanderer, is fused with a dying human named Melanie Stryder, in an attempt to locate the last pocket of surviving humans on Earth. According to the report, Meyer had, in the past, refused all offers to bring The Host to the big screen. But apparently, these producers came to the table with the right combination of deal and vision for the project which finally made her agree. Having never read The Host, nor any of the Twilight novels, all I can say is this must be good news for those of you who have. Judging from fan’s reaction to those books and films, I have little doubt The Host will meet with similar success — especially if the film somehow features Robert Pattinson and Kristen Stewart. Summit releases the second adaptation of Meyers’ vampire series, The Twilight Saga: New Moon, on Nov. 20.